All right, everyone, up and at 'em! 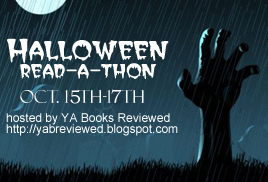 It's time for Day 2 of the Halloween Read-A-Thon! If you haven't already, head on over to Young Adult Books Reviewed to sign up. I will be editing this post with all of my updates today. Well, it turned out I had a touch of insomnia last night. It probably had something to do with the extremely loud snoring coming from the other bedroom. (Note: Don't drink alcohol when you're congested. It just makes it worse!) I got about three quarters of the way into Undead and Unwed before sleep finally won the battle. Finished up Undead and Unwed, had lunch with the boy. Now, I can't decide whether to start Scent of Shadows by Vicki Pettersson or The Replacement by Brenna Yovanoff. Will have to see which one pulls me in more after a few chapters. It's always when you try to clear your schedule that chores crop up. It's been kind of a slow reading day. I've stalled out on The Scent of Shadows, so I'm switching to The Reapers are Angels by Alden Bell. Finished The Reapers are Angels - very quick read, not terribly impressive, but I'm glad I finally got it out of my system. There were a few weeks where I would walk by this book displayed on an endcap at the local bookstore, and I swear it was calling my name. I also read one of the stories from the Kiss Me Deadly anthology. I'm going to try to get in a few more chapters of The Scent of Shadows before calling it a night.